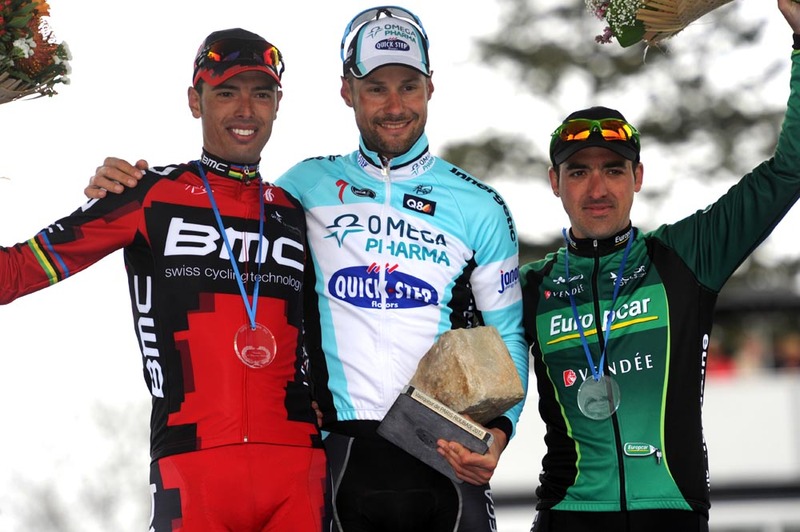 Tom Boonen (Omega Pharma-QuickStep) won the 2012 edition of Paris-Roubaix in France on Sunday, sealing his place as the current generation’s king of the cobbles. The Belgian launched a solo move some 50 kilometres from the finish in the Roubaix velodrome, and that was the last his rivals saw of him. Frenchman Sebastien Turgot (Europcar) took second just ahead of Alessandro Ballan (BMC Racing), one minute and 39 seconds behind Boonen. Thirty-one-year-old Boonen becomes only the second rider to win Paris-Roubaix on four occasions – 2005, 2008, 2009 and now 2012. Roger De Vlaeminck set the record in 1977. Boonen has enjoyed a comeback to absolute top form this year, having dominated the spring classics with wins in the Tour of Flanders, Ghent-Wevelgem and E3 Harelbeke. BMC Racing, Omega Pharma-QuickStep and Sky were the squads taking control at the front of the bunch of the race as they chased a 12-man break up front, which had formed before the first cobbled sector of the day. The escape built up to around four minutes and 45 seconds at its maximum, at around the 120 kilmetres-to-go mark before steadily dropping as the relentless 27 cobbled sectors started to take their toll. The infamous Arenberg cobbled sector really broke up the field, with several riders dropping chains, suffering other mechanicals or just unable to keep pace on the rough, mossy cobbles. Sylvain Chavanel (Omega Pharma-QuickStep) gave the French national champion’s colours a good show as he wound up the pace at the head of affairs. After the Arenberg, the break started to split up as several riders got news that the chasers were gaining on them, their time advantage slipping well below two minutes. Tom Boonen (Omega Pharma-QuickStep) then launched an attack, followed by Filippo Pozzato (Farnese Vini) and Sebastien Turgot (Europcar). 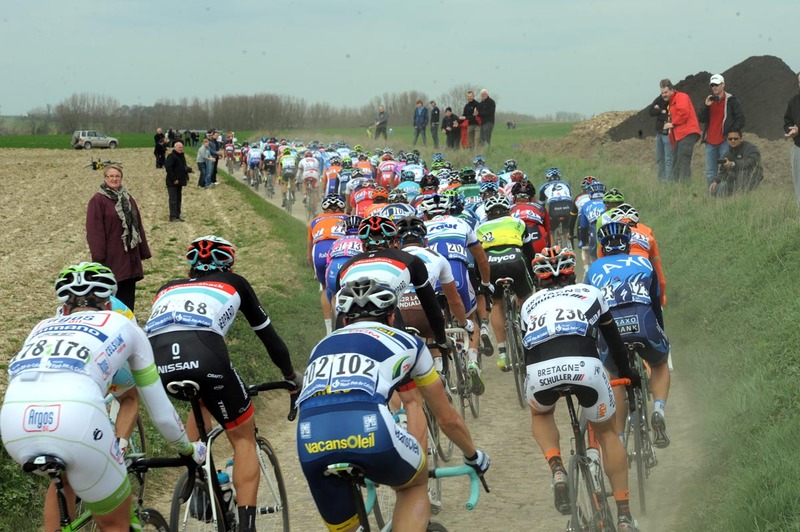 They were joined first by Alessandro Ballan (BMC Racing) to recreate the lead group of the Tour of Flanders, and then Boonen’s team-mate Niki Terpstra made it five up front. The two Omega Pharma riders then broke free from their companions. Pozzato crashed, ending his chances with the leaders. Terpstra worked hard for Boonen and then fell back, looking to disrupt the chase. The ploy worked, with Boonen swiftly elevating his lead despite a concerted chase by Sky behind with 50 kilometres to ride. The earlier escape splintered under the pressure and was caught. Brit Ian Stannard put in a monster turn on the front of the chasers for Sky, working for team-mates Juan Antonio Flecha and Edvald Boasson Hagen. Ballan, Lars Boom (Rabobank), and defending Paris-Roubaix champion Johan Vansummeren (Garmin-Barracuda) were also in there. Boonen, though, wasn’t stopping for anyone. And continued to build his lead to over a minute going into the final 30 kilometres despite the quality and experience of the chase group. Boonen slipped into time trial mode, a move reminiscent of his absent rival Fabian Cancellara, the RadioShack-Nissan rider forced to miss the race due to injury. 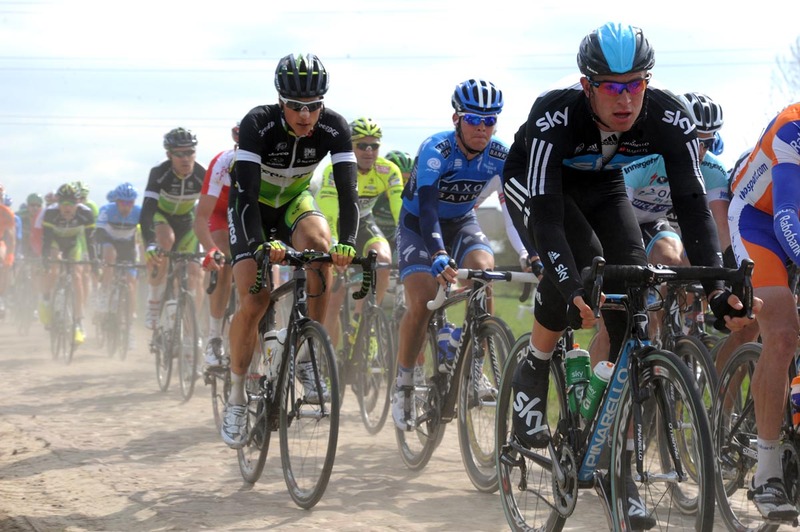 Over pavé and road, Boonen continued his minute’s advantage over the chase group. In the final 25 kilometres, Flecha, Ballan, Boom and Vansummeren decided enough was enough and upped the pace as Boonen hit sector six. The increase in speed saw the end of Boasson Hagen’s participation in the chasing pack, as Sky’s earlier efforts started to show. A lack of organisation in the chase played into the hands of Boonen, who’s advantage stretched out to 1-21 in the final 18 kilometres – the Belgian showing no sign of slowing up. 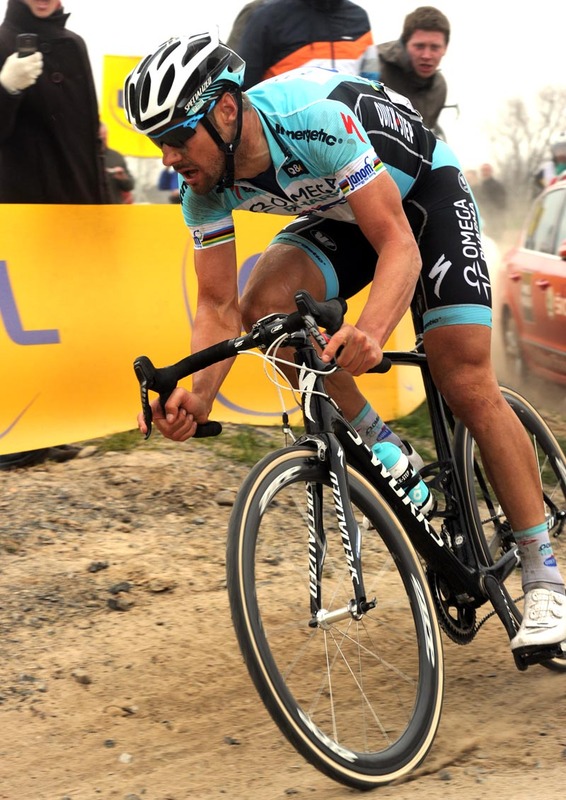 own bid to catch Boonen. He was later caught by Flecha, Ballan and Mathieu Ladagnous (FDJ-BigMat), but Boonen was away – and the race was now for second place. Ladagnous suffered an untimely puncture, leaving a trio of chasers. By the time Boonen hit the penultimate cobbled sector, his lead had crept up to over a minute and a half and it stayed that way as he entered the Roubaix velodrome to thunderous appreciation from the crowd. He had time to play with, and slowed to savour the moment of crossing the line with arms aloft. As Boom, Flecha and Ballan played cat and mouse, Turgot and Terpstra crept up behind them on their lap of the velodrome, with Turgot just edging out Ballan on the line for second.